← Again, it’s only your choice! 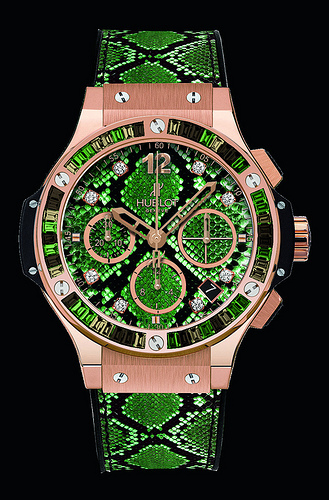 The ‘Boa Bang’ (Hublot’s Big Bang collection) features an 18k Rose Gold satin finished Case & Bezel. The watch’s face is set with 8 diamonds and gold plated hands to help you tell the time. And to complete the snake-ish appearance of the timepiece it comes complete with a black rubber and green python skin strap.